One of the most hidden features of StudioShell is also one of the most useful: Solution Modules. If you don’t already know, modules are PowerShell’s way of packaging functionality into reusable units. For instance, the PSake build automation tool is a module. From your PowerShell session, you yank in the PSake module as a single unit using the import-module cmdlet. When you’re done, you can remove the PSake module from your PowerShell session using the remove-module cmdlet. Solution Modules are the same idea. The only difference is that a solution module lives inside of your Visual Studio solution, with your code. StudioShell automatically recognizes these modules and imports them when the solution is loaded. When the solution is closed, the module is removed. 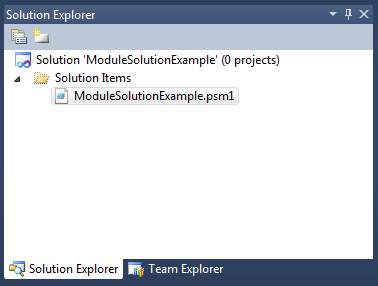 This makes Solution Modules a perfect way to pack your Visual Studio modifications with your solution. If you haven’t already, install StudioShell. Start Visual Studio and create a new empty solution. Name it “ModuleSolutionExample”. Save the file. Close the solution. Now open the StudioShell console and output window from the View menu. Now close the solution. The string “Unloading Solution Module” will appear as the solution is unloaded . the file must reside in the same file system location as the .sln solution file. Outside of that, the sky’s the limit. And the best part is that the scripts travel with the solution itself, keeping your tools close to your code. The scripts in the installer at the time this post was written contain a bug that prevent solution modules from unloading. The TIP of the repository contains the fix.